Pet Microchips: Check the Chip! Microchip implants for pets are a great way to help identify and ensure your pet’s safety. Microchips contain a radio-frequency identification transponder encased in a capsule of bioglass. (These are used for implants in both humans and animals.) The chip is used for the sole purpose of storing an ID number that is unique to your pet. The number is then linked to your contact information and registered with a database service. 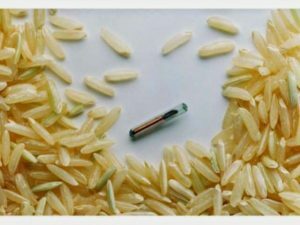 These small tags are no bigger than a grain of rice, and usually also have an anti- migration feature that ensures the microchip doesn’t travel throughout the animal’s body. It is important to get your pet’s microchip checked annually. This is to ensure that the implant is still capable of transmitting information. Since it contains no moving parts, the microchip should last your pet’s lifetime. To check the chip, simply bring your animal to your veterinarian’s office. 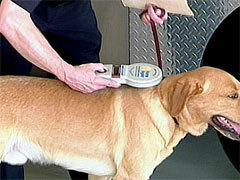 There they will use a small scanner to confirm the microchip’s location and verify the corresponding information. They can also let you know if you need to renew your registration to the microchip service. 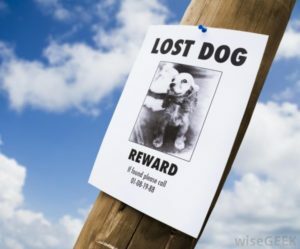 It is important that you keep the chip’s contact information up to date so that the national pet recovery database is able to contact you and return your pet to you in the event they get lost.